The Grasshopper Company is doing its part to ease the transition for a veteran who returned home from combat with the dream of launching his own lawn care business. 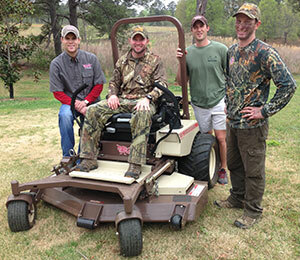 The riding mower manufacturer partnered with the Military Warriors Support Foundation (MWSF) and comedian Jeff Foxworthy to donate a commercial zero-turn mower to Tom Trotter, a 28-year-old retired Marine from West Melbourne, Fla.
Trotter, who received his new Grasshopper mower from Grasshopper and MWSF representatives during a turkey hunt at Foxworthy’s Georgia farm, will be featured on the April 29 episode of Jeff Foxworthy “Inside & Out,” an online web series sponsored in-part by Grasshopper. In 2011, Trotter was wounded in combat while on patrol in Afghanistan and paralyzed in his left arm for eight months. The injury eventually resulted in his medical retirement from the Marine Corps in 2012. Grasshopper selected him from a pool of candidates (veterans who had previously been selected for 100 percent mortgage-free homes through MWSF’s Homes4WoundedHeroes program) provided by MWSF due to his experiences while on active duty and his dream of owning and operating a lawn care business. “The combination of a mortgage-free home and a Grasshopper mower will help Tom get back on his feet and transition back to civilian life as quickly as possible,” said Josh Kinser, MWSF’s senior director of field activities. Trotter said that receiving the new mower is one of the highlights of his life, and it will help jumpstart his professional lawn care business. He currently is working on a business plan for his lawn care company, which will serve the Brevard County area in central Florida. Grasshopper said it plans to continue its partnership with MWSF and donate a mower to a combat-wounded veteran on an annual basis. Veterans interested in receiving a mower in the future should contact Military Warriors Support Foundation for more information.